Measurements: 3.2 x 4.6 inches, or 81 x 118 mm. Back of card: Black. At the bottom, a white triangle with black center. Rising inside the base of the triangle, a yellow "gear". Rising above the triangle, a red Latin cross. A striking design in its own right which to me defeats the purpose of a card back. Not for inversion. Book included: Yes, 177 pages, 3.45 x 4.95 inches, or 87 x 125 mm. Yes, the book is bigger than the cards, but does not illustrate them. Comments: Llewellyn is pioneering a new kind of tarot packaging with a real book the same size as the cards & both cards & book packed inside a slipcover. It's a small book, but it has a real cover (printed in color) & is properly bound. Unfortunately the cards are not illustrated in it, but five are shown on the back cover. The overall packaging is very good. At the moment (April 2000), Llewellyn has half a dozen decks in this format. This is intended as a magical tarot. The book gives explanations for many of the features on the cards, including "flashing colors" (colors that change when you stare at them), Qabala, astrology, divination, ritual. Work on this deck was started under the sponsorship of Israel Regardi, who passed away before it was completed. It is a most complex deck. The book is a useful introduction to using the tarot in ritual work. 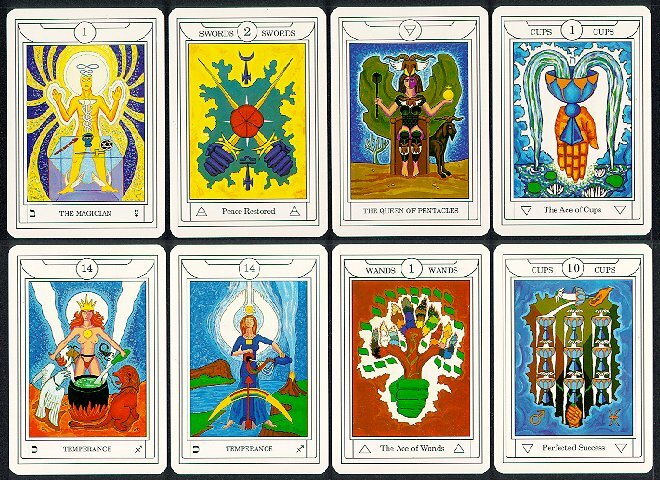 Unique to this deck are the two Temperance cards, as specified by the Order of the Golden Dawn, but nowhere in the book can I find why or what they mean or what to do with them. Which only means there's a lot more to Tarot & Magic than what folks will put in a small book, but I've known that for a long time. The style of the cards is similar to a number of other recent tarots, forgive me that I can't quite remember their names at the moment.